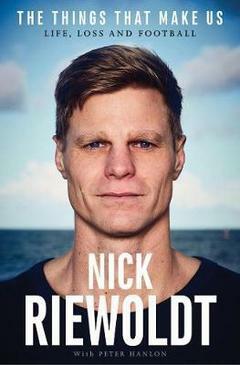 From number one pick in the 2000 AFL draft, to six-time winner of St Kilda's best and fairest award, to five-time All Australian, to captaining his club for a record 220 games, to more than 330 games as a star of the AFL, Nick Riewoldt is an out-and-out champion. 'I never wanted to write a 'cookie-cutter' footballer's book-chronologically moving from the under 8s through to the big time, full of hard-ball gets, wins and losses, triumphs and disappointments. I chose the title, The Things that Make Us, because it made it easy to explore things we can all relate to, no matter what path our lives have taken. I hope there's something in these pages for everyone who's known grief, especially anyone who's lost a sibling. I hope, too, that my story brings a deeper understanding of a footballer's crazy world. An insight into what goes into making it, what it takes to stay there, and the crippling anxiety that can consume you when your burden is to accept only the best. I hope it paints a picture of what it's like to be the focus of acclamation and scandal, the good and bad of a searing spotlight, and how these experiences can bring out the best and worst in us. I hope it honours my family-the German and Tasmanian sides with their stories of struggle and endurance who somehow came together, who are the essence of the book's title. I hope it gives thanks for the love I found on the other side of the world, and the beautiful next generation Cath and I are building together. I hope above all that it honours my sister Maddie.